This article originally appeared in the December 2016 issue of The Journal of the Delaware State Bar Association, a publication of the Delaware State Bar Association. Copyright © Delaware State Bar Association 2016. All rights reserved. Reprinted with permission. This article originally appeared in the March 2016 issue of The Journal of the Delaware State Bar Association, a publication of the Delaware State Bar Association. Copyright © Delaware State Bar Association 2016. All rights reserved. Reprinted with permission. To celebrate Thanksgiving, my students and I created and enjoyed an elegant cheeseboard featuring the below seven cheeses. As you know, a cheeseboard should contain cheeses of various textures from various countries of origin – this board did just that. If seven is too many, choose any subset of three or five – an odd number is a must! The below descriptions are from the cheesemonger and/or from the producer’s online descriptions. Our accompaniments were Marcona almonds, Acacia honey, and fruit and nut crisps. It was no surprise that the favorite was the Saint André…who doesn’t like butter? The Cambazola was also a standout and an effective way to introduce young turophiles to blue. This assortment would be ideal for a holiday soirée with some Prosecco or Crémant d’Alsace. Cheers, or should I say “Cheese”! This soft-ripened, triple crème cheese is a product of Soulie, France. Its luscious, mild, buttery flavor and velvety smooth texture make it a favorite of most everyone. St. André may be served before a meal or for dessert with fresh fruit. This is Cowgirl Creamery’s signature cheese. Smooth and creamy, this triple cream is made with organic milk in Petaluma, California. It is firm yet buttery with a mellow, earthy flavor, reminiscent of white mushrooms. This washed-rind, pressed curd cheese is from Lombardy at the foot of the Alps. Its flavor is rich, buttery, and beefy with nuances of fruit and nuts. Its texture is creamy yet substantial. Fruit and crusty bread serve as good companions. Serve it alone or consider sliced sopressata and prosciutto. This is Spain’s most popular cheese, and this version is aged for 4 months. It is uncooked, pressed curd cheese that is made from sheep’s milk in the region Castile-La Mancha. Look for the cross-hatched tire track pattern on its rind from the basket in which it was pressed and aged. Enjoy it with fruit and truffle honey. This cheese has been twice named the best cheese in the world. It is made from raw sheep’s milk in the French Pyrénées. One of the oldest and most heavenly of cheeses, its origin goes back thousands of years. Enjoy the splendid nutty and fruity flavor of this firm cheese with fresh pears and figs. This cheese is from the heart of the Loire Valley and aged for one month. The name means “crown” because it is shaped in a small crown shaped ring coated in vegetable ash. While the center is a chalky texture, it becomes creamier closest to the bloomy (soft and fluffy) rind. This smooth, creamy, soft-ripened cheese combines a rich German triple-crème with Italy’s marvelous Gorgonzola dolce. Cambazola is intended to appeal to those who find blue cheese a little too harsh and spicy. The smooth and creamy texture is enhanced by subtle blue veins, creating a mouth-watering experience. During this heat wave, a light dinner showcasing fresh ingredients is ideal. This pasta with onion, bacon and tomato is simple enough to prepare while enjoying some Olympic events. Sauté the onion in several tablespoons of extra virgin olive oil until soft and translucent, about five minutes. In the meantime, bring a large pot of water to a boil. Slice the bacon into 1/4 inch strips, then halve each strip. Add the bacon to the onion and sauté until lightly browned, about seven minutes. Keep stirring the onion and bacon with a wooden spoon, and season with pepper to taste. Stir in the tomatoes and sauté for several minutes until they “pop”. Throw the pasta into the boiling water and stir. The pasta is so delicate that it should only take about two minutes. When al dente, remove the pasta with tongs and add to the onion, bacon and tomato mixture. Also, add about 1/2 cup of the pasta water to the pan to help the sauce stick to the pasta. Using a wooden spoon, coat the pasta with the sauce, and toss in some fresh basil. Serve with grated parmesan cheese and red pepper flakes. Enjoy with a light red wine, such as a Grenache. Transform ordinary chicken livers into an extraordinary sauce with this recipe from The New Basics Cookbook by Julee Rosso & Sheila Lukins, authors of The Silver Palate Cookbook – two of my favorite cookbooks! If the chicken livers are large, cut them in half. Combine the flour, paprika, salt, and 1/2 teaspoon of the pepper in a mixing bowl. Heat the oil in a large skillet. Dredge the livers in the flour mixture, and sauté until browned, about 5 minutes. Raise the heat slightly, and add the tomatoes, vinegar, chicken stock, wine, and rosemary. Simmer until slightly thick, 5 minutes. While the sauce is cooking, bring a large pot of water to a boil. Add the pasta, and cook at a rolling boil just until tender. Drain, and toss with the sauce. Add the remaining 1 teaspoon pepper, and serve immediately. This weekend I was reminded how simple it is to make fresh pasta. As I was flipping through Mario Batali’s The Babbo Cookbook for inspiration, I decided to use his recipe for a variation on a basic pasta dough. Mound the flour in the center of your work surface. Make a well in the middle of the flour and add the eggs, olive oil and black pepper. Beat the eggs, oil and pepper together with a fork, then incorporate the flour starting from the inside rim of the well. Expand the well by continuing to incorporate flour while making sure to retain the shape of the well. As the dough comes together, knead with the heels of your hands. Push aside any floury bits that do not incorporate, sprinkle more flour on your work surface and knead for about 5 minutes. The dough will be slightly sticky but should not stick to your hands. Place the dough in plastic wrap and let it sit for 30 minutes at room temperature. Roll out the dough into your desired shape…We rolled the dough through the thinnest setting on our pasta machine and then rolled it through the fettuccine attachment. This recipe makes about one pound of pasta. Half of this recipe was more than enough to serve as a side to a braised rabbit for two. My new goal – enjoy a homemade pasta once a week. Abbondanza! Everyone knows that French women love wine and cheese, but did you know that they also love pasta? My husband and I have tried several flavors, including the Lemon Chive Angel Hair, Orange Szechuan and Spicy Thai Linguine. The pasta is packaged in eight ounce containers, ideal for serving three or four. The Lemon Chive Angel Hair had a subtle, fresh flavor – a perfect pairing for shrimp and scallops. To prepare, bring a large pot of water to a boil. Add the pasta and stir. While the pasta is cooking (which will only take a few minutes), heat a nonstick pan over medium heat and add several tablespoons of butter. Allow the butter to foam, and tilt the pan around so that the butter coats the bottom. Place the shrimp and scallops in the pan, cooking for about two minutes per side until opaque. When the pasta is ready, drain the water and add the pasta to the sauté pan of seafood. Using a wooden spoon, blend the pasta and seafood and coat the pasta with the butter and oil. You will likely need to add additional butter. Plate the shrimp and scallops atop the pasta and season with freshly squeezed lemon juice, ground pepper and sea salt. If you would like additional heat, try a dried red pepper! Look for French Women Pasta and their unique flavors this fall…from Lavender to Porcini Mushroom to Lime Cilantro. If you are fortunate enough to have squash blossoms in your own back yard, don’t let them go to waste! They are only available to enjoy for a few short weeks. When I walk through the neighborhood and spot these beautiful flowers in a garden, I hope that the owner will use them at their peak and make fritters for dinner. If you are not growing your own, see if a local farm or market will supply you with these summer delicacies. The mild squash taste of the flowers makes for excellent fritters; however, if you are in the mood for a non-fried option, try the vibrant flowers in a salad. 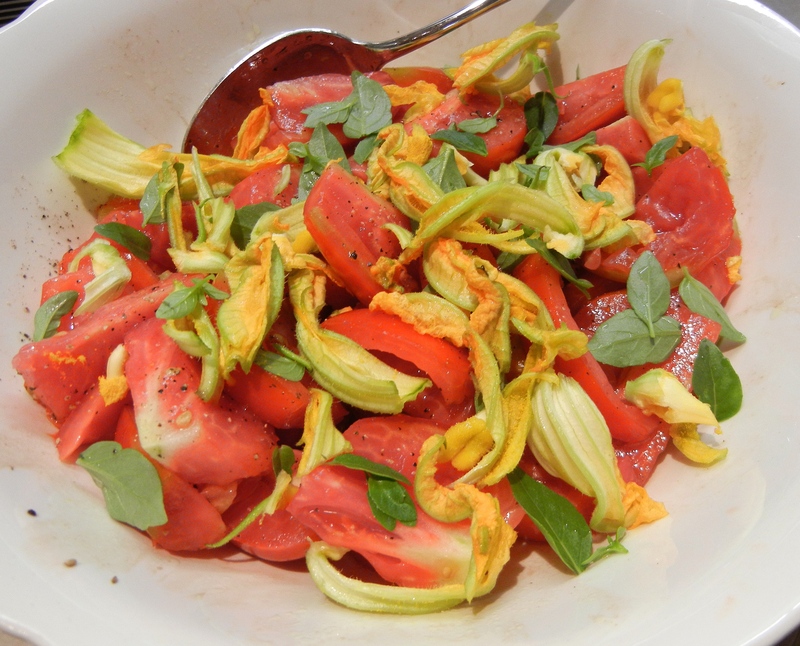 A very simple one to showcase both taste and color is to slice a juicy, ripe tomato into wedges and add strips of squash blossoms. Combine with fresh basil for some green, and top with a light dressing of balsamic vinegar and extra virgin olive oil. Of course, season with sea salt and fresh ground pepper. This salad should prove to be one of your favorites this summer. 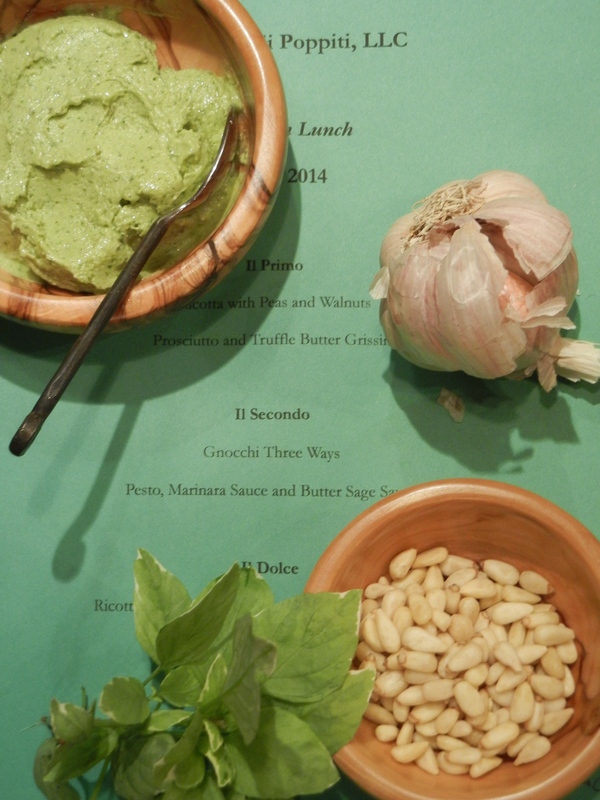 During my Italian Lunch cooking class today, we made ricotta gnocchi with three sauces – marinara, pesto and butter sage. While the marinara and butter sage sauces were quite delicious, the pesto made me appreciate the abundance of basil this time of year. 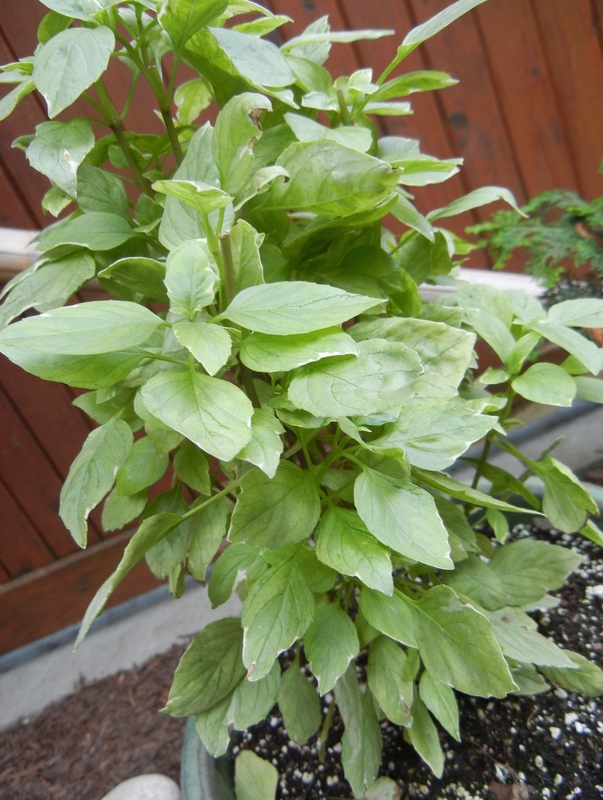 So, I share my recipe for basil pesto. Remove the basil leaves from the stalks and place them in a food processor. Add the pine nuts, garlic, cheese and butter and blend until it forms a paste. Add the olive oil little by little as well as the salt and pepper to taste while blending the other ingredients. Be sure to use a spatula to push down any ingredients stuck to the sides of the food processor in between your processing. Toss the pesto with gnocchi or your favorite pasta – a little goes a long way!